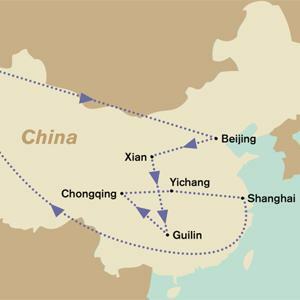 Arrive in Beijing, your gateway city of China tour. You are met at the airport and transferred to your hotel to relax and freshen up. The rest of the day is at free for leisure. In the morning drive 75km to visit, theGreat Wall at Juyong pass which is the symbol of China and the wisdom of Chinese people. It is remarkable that the Chinese succeeded in building such a great architecture with simple tools from ancient time. You then visit the Jade Factory and Ming Tombs (Changling Tomb), consisting of 13 tombs of the emperors of the Ming Dynasty which dates back to when the capital was moved from Nanjing to Beijing. This place is unique as it is the only huge palace made from camphor wood. If time permits, you will have a short stop to take some photos in Beijing Olympic Park, where you can see the outside view of the National Stadium - Bird’s Nest and National Aquatics Center - Water Cube. This evening an optional Kung Fu show is available. Today post breakfast you will be transferred to the airport for your flight to Xian. On arrival, you will visit the City Walls. It is the most complete city wall that has survived in China as well as one of the largest ancient military defensive systems in the world. Later visit the Big Wild Goose Pagoda a well-preserved ancient Building and a holy place for Buddhists. Then you will visit Special art lacquar work shop. Later you will have free time for shopping at famous Ancient Style street, In the evening enjoy an Optional show of the Tang Dynasty. After breakfast you depart for a full day tour with a visit to the China's Richest historic area, which is recognized by the UNESCO as the eighth wonder of the world, to the amazing Museum of the Terra Cotta Warriors which is very famous for the great underground army of the first Emperor of China, buried together with him 2200 years ago and discovered only in 1974. It is the most significant archaeological excavations of the 20th century. You then visit Moslem Street. The Chinese Muslim quarter in Xian. Today you will check out from the hotel, and will be transferred to the airport to take your flight to Guilin. On arrival you have a half day visit of Elephant Trunk Hill, a huge rock formation of an elephant by the confluence of the Yang and Li rivers, which resembles a trunk, dipping into the water. The next wonder to visit is Reed Flute Cave, which is named after a certain kind of reed grown near the cave gate. This reed is used for making a flute instruments. The cave with its natural beauty will undoubtedly evoke breathless admiration for you. Depart from your hotel in the morning and begin your half day Li RiverCruise which is a masterpiece of nature. The crystal waters, picturesque mountains, peaceful farm fields, hard-working fishermen and wondering water buffalos compose a poem of Guilin scenery and life. Under the blue sky, your boat floats along the serene river, giving you an unreal dream to remember. After you disembark the Western-influenced town of Yangshuo, you have time to roam the West Street, whichearns its due to almost everyone here can speak fluent English as well that restaurant or bar offers menus in several languages. You feel no borders or distance here and will instantly fall in love with this quaint town. Moreover, it is flanked by small shops and vendor stalls selling different kinds of souvenirs, Later return to Guilin in the early evening. After breakfast at the hotel, you will be transferred to the airport for your flight to Congqing. On arrival you will be taken for a city tour introducing you to the 3 Georges Dam structure. After dinner, transfer to the pier to embark for your wonderful Yangtze River Cruise for the next 3 nights. Cruise start sailing at night. Today, the first shore excursion of your cruise occurs either at Fengdu, Shibaozhai or Wanzhou, which depends on local river conditions. This morning after breakfast, you cruise along the Three Gorges namely Qutang Gorge, Wu Gorge and Xiling Gorge, during which you take an excursion through the Daning River Lesser Three Gorges. In the evening you sail through the magnificent 5 ship locks of the 3 Georges Dam. Early in the morning you take an excursion to visit Three Gorges Dam. After your return form the excursion you disembark at Yichang for your flight to Shanghai. Upon arrival, you will be transferred to the hotel. Where, you will have some time to relax. Today you visit a famous Buddhist shrine - Jade Buddha Temple,located in a crowd of Shanghai City. It is named for its two bejeweled white jade Buddha. Carved from a whole piece of white jade, the sitting jade Buddha statue is translucent with a solemn expression, displaying the excellent skill and extraordinary art of Chinese people. Yuyuan Gardenhas many scenic courtyards decorated with baroque rockery, pools, and flora that are all connected by corridors and passageways. Then you will visit Pearl Factory. The shopping trip will begin in Nanjing Road which is starts at the Bund and runs westward, with People's Square in the middle. Renowned for its bustling and modernization, Nanjing Road earns its reputation as the 'First Commercial Road in China', which is the good shopping heaven for your trip as the same as the Fifth Avenue in New York and Avenue des Champs-Elysées in Paris. Some of the traditional food and handicrafts of Shanghai can be found here. Then you come to the Bund, The renowned waterfront district is the city's most famous landmark. The word BUND is of Anglo-India origin meaning embankment on the waterfront. It is also the popular site to enjoy the night view of the city. Standing at Pudong New Area at the east side of Huangpu River, Oriental TV Tower was completed on October 1, 1994. The tower has a height of 468 meters. With multi-functions of sightseeing, catering, shopping, amusement and accommodations, this tower has become the symbol of the city and a popular tourist attraction in Shanghai. After breakfast you will be transferred to the airport (depending on your flight time) for your flight back home.